Search engine optimization (SEO) is the process of improving the visibility of a website or a web page in search engines. ie Google, Yahoo or any other search engine on the web. Search engine optimization (SEO) is the process of affecting the visibility of a website or a web page in a search engine’s natural or un-paid search results. In general, the earlier (or higher ranked on the search results page), and more frequently a site appears in the search results list, the more visitors it will receive from the search engine’s users. 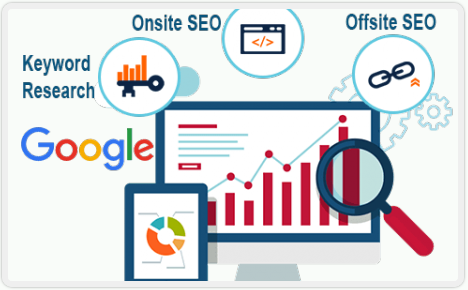 SEO may target different kinds of search, including image search, local search, engines being successful in utilizing our skills, has let to our clients being very pleased with the results. How important is it to be on the first page of Google? If your product is important and you need more new customers this is a very powerful tool to get your website to work for your business. Research has proved that only the first five listings on Google when searching for something are seen as professional at what they do. This process takes three to six months and is ongoing and also linked to your social media. We mastered the Google Adwords system. By utilizing Isp warehouse to manage your Online Advertising Campaign on Google Adwords – you will pay the minimum per click whilst being listed amongst the top of your industry. Isp warehouse has established a niche in the IT industry by successful marketing of new websites, implementing SEO to achieve high rankings on search engines such as Google. This gives our clients an advantage to be one step ahead of their competitors. Our Drupal website developers and marketing teams are backed up by a strong research and development team, who constantly keeps us up to date with the latest technical developments and we pass it on to our clients, resulting in affordable price tags. Based in Pretoria South Africa, our in house Search Engine Optimisation (SEO) team works tirelessly at making your business and website more accessible on the world wide web. Contact us for a FREE website analysis.